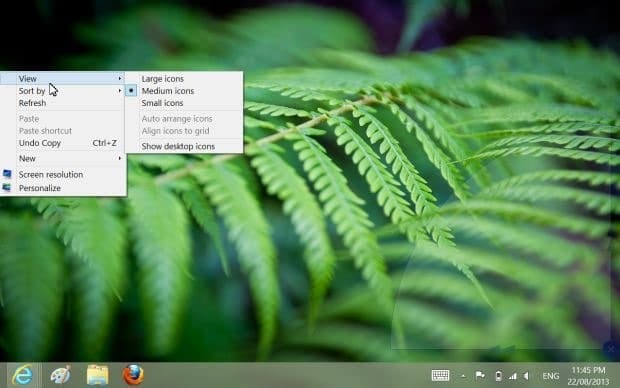 While both Windows 8 and Windows 8.1 have been designed for both touch and non-touch devices, the newly introduced Modern UI works great on touch devices, and the desktop environment is perfect on typical PCs with keyboard and mouse. Navigating the desktop environment on a tablet with 8 or 10-inch screen is one of the biggest annoyances of Windows 8 and Windows 8.1. Those of you using a Windows 8 or Windows 8.1 tablet probably have noticed that neither native desktop programs nor third-party applications are optimized for touch screens. When using desktop programs we often need to increase the size of menus, buttons, and other items to easily access options and menus. For instance, at times, you might end up tapping the Close button while attempting to tap the Minimize button of a program window. Even though all Windows tablets house USB ports, and one can connect a mouse to easily navigate the desktop environment just like you would on a laptop, users who often carry their tablets might not want to carry a dedicated mouse all the time. Even though Microsoft Surface and Surface Pro owners can acquire a touch or type cover, other users have very limited options. Wouldn’t it be cool if there was a way to add on-screen touchpad? As you probably know, about a month ago, we had covered about a tiny utility named Touch Mouse Pointer to get mouse pointer on your touch device. While the program works, you’ll will be happy to know that there is a much better professional program available to add touchpad to your Windows 8 touch device. Appymouse is a paid software designed to add a transparent on-screen touchpad to your Windows 8 touch devices. Once installed, Appymouse transparent touchpad sits on the screen and allows you control your desktop environment and desktop programs. Since it supports only desktop environment, the on-screen touchpad will not appear when you switch to the Start screen or when you launch a Modern UI app. By default, the transparent touchpad appears lower-right corner of the screen but you can move it anywhere on the screen by dragging arrows that appear on the vertical and horizontal axis of the touchpad. As with the physical touchpad, you can click, right-click, and double-click with the help of Appymouse. 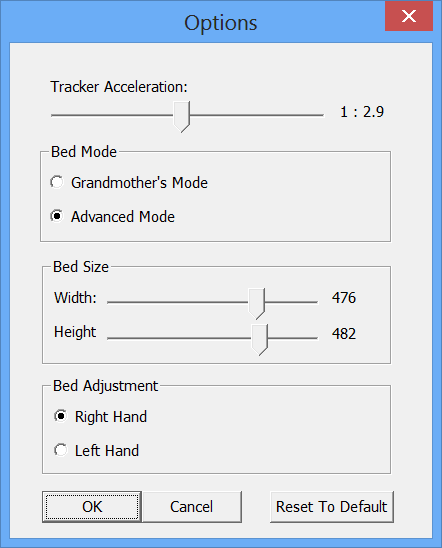 You can change the default size (height and width), and tracker acceleration by right-clicking on Appymouse icon running in the system tray and then clicking Options. Overall, it’s a handy software to get virtual touchpad on your Windows 8 tablet. Visit the developer’s page to download the 30-day trial copy. Users who are finding it difficult to use desktop applications on a touch device can install this software to significantly improve the productivity. And if you are looking for a free software for the same job, you can try out Touch Mouse Pointer to get mouse pointer with trackpad on your Windows 8 or Windows 8.1 touch device. 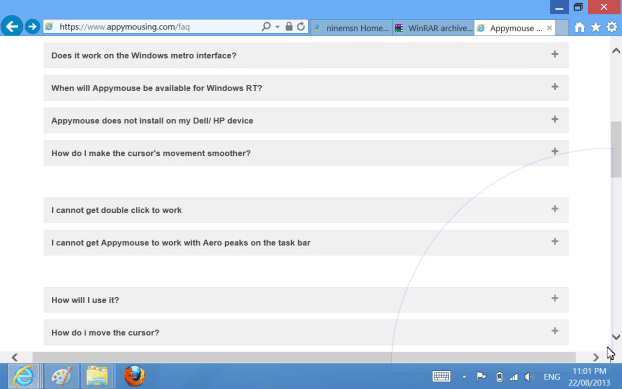 Please note that the current version of Appymouse doesn’t support Windows RT. However, according to the developer, a version of Appymouse is being developed for Windows RT and will soon be released.